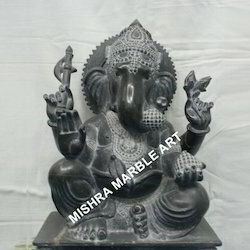 In our diversified range, we bring forth for our clients an exclusive Black Marble Ganeshji Statue. Capitalizing on the creativity of our workforce, we are able to assure our clients that this statue is one of its kinds. Carved beautifully, every detail of this statue regarding the facial expressions the posture the ornaments and accessories adorns the lord. Our clients can avail this from us at most competitive prices. 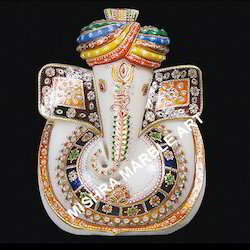 We have every sizes and with lots of designs of God Ganesha. 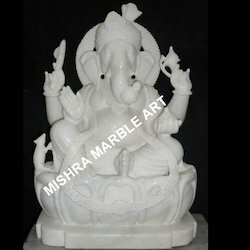 Clients can avail from us superior quality White Marble Sarvdayak Ganesha statues carved out of superior quality white marble. This ganesha statue has a peaceful and calm appearance and is ideal for the place of worship. Details such as the sitting position, the hand postures the ornaments and accessories are all well crafted. This statue has glossy sheen that further enhances its appeal. 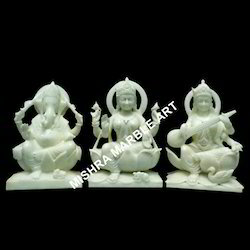 We offer a set of three statues depicting Ganesh, Laxmi And Saraswati Ji. These statues are carved out using pristine white marbles. The dexterous efforts put in these statues are evident from the detailed work and superior finish. Clients can avail this set of three statues from us at economical prices. 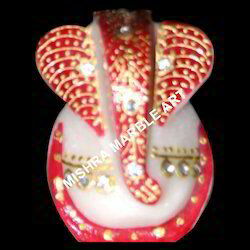 We also offer an exclusive range of standing ganesh ji moorti to our clients at competitive prices. In this statue, ganesh ji idol depicts the lord sitting on his shrine with his vahana, the mouse. Further, this statue is decorated with bright paints and golden colored. In this statue lord ganesha state has four hands, two of which are holding weapons, one hand has his favorite modak and another raised in the boon giving gesture. 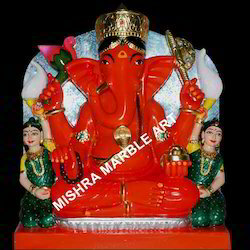 Our organization offers Ganpati Statue that are carved by creative experts. The detailing have been done with utmost precision and it is assured that the weapons and other features of Lord Ganesha are clearly visible in the structure. Extremely popular amongst our clients spread world-wide, these statues help us gain an edge over our competitors in the market. Lord Siddhivinayak Ji also considered a form of lord ganesha, is worshiped with full fervor by hindus all over the world. This statue is made using premium quality marble stone is painted blood red in color. In this statue, lord siddhivinayak is shown sitting in a meditative posture with his two wives riddhi & siddhi. This statue is further made appealing with the use of golden colored embellishments for the ornaments and accessories of the lord. 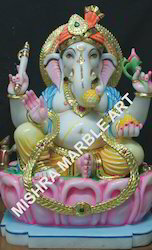 Our esteemed clients can avail from us unmatched range of Ganesha In Colourful Marble. This statue is hand painted using interesting colors that makes it stand out. It is crafted using rounding shape of the marble and ideal for gifting purpose. Moreover, this is also used for showing the clothes of the god. 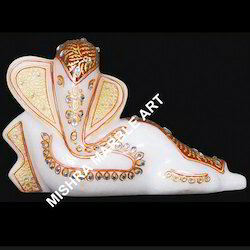 We offer a Decorative Statue of Lord Ganesha that look elegant and have high aesthetic appeal. that look elegant and have high aesthetic appeal. These elephant statues are intricately carved by our skilled artisans. Each and every curve and move of the elephant is clearly reflected through our artistry. 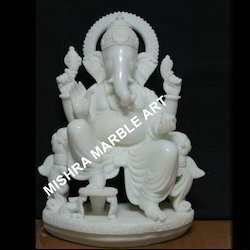 Crafted by our experienced professionals this Marble Ganesh Ji Statue is aesthetically appealing and suited for placing in temples. 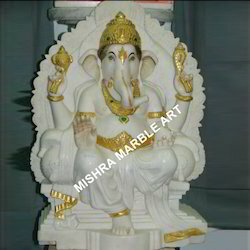 The large sized Marble Ganesha statue depicts the god in sitting position on his lotus shrine. Small details such as the crapes of clothes the ornaments and accessories have been intricately carved out by our sculptors and artisans. This statue of the god it this vahana the mouse can be availed form us within industry leading price range. 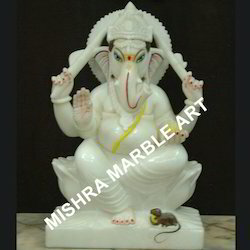 White marble Ganesha 2 Inches is dexterously carved. Ganesha in east symbolises strength and power. 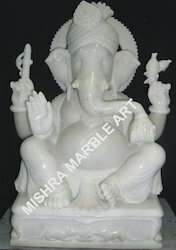 White marble ganesha is dexterously carved. Ganesha in east symbolizes strength and power. 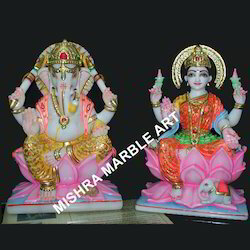 We offer an exclusive range of Ganesh Lakshmi Statue. We offer an exclusive range of Ganesh Laxmi. 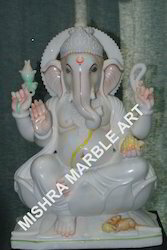 We present an exclusive range of white marble ganesha with riddhi and siddhi to our clients at industry leading prices. 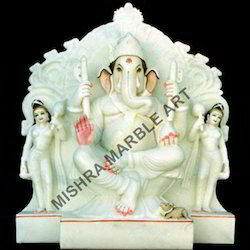 These white marble ganesha idol is provided with his two wives ridhi and sidhi. Our range is carved out using plain white marble stones with extensive detailing. These are ideal for decorating homes and also used for gifting purpose. We also use subtle colors for painting that enhance the look of statue. We bring forth for our clients an attractive array of Ganesh Moorti. These are used for worshiping and gifting purposes. Our artisans use superior quality marble stones and paints for designing our range. The structures are packaged using high quality material so that these remain free from damage during transportation. 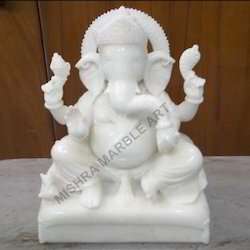 Vighnaharta Ganesha Statue is beautifully carved in pure white marble. 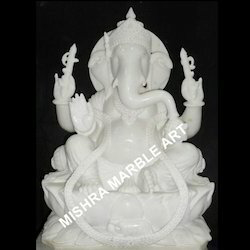 Offered by us is a high quality White Ganesha Moorti. 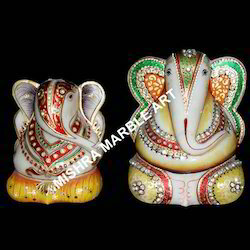 Designed with precision, these marble sitting Ganesha Idols are highly demanded in domestic as well as international markets. 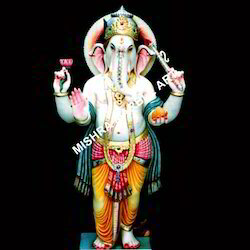 These depict Lord Ganesha in a sitting posture with laddu in one hand and broken tusk on the other. Elegant in design, these idols are made available to the clients at reasonable prices. 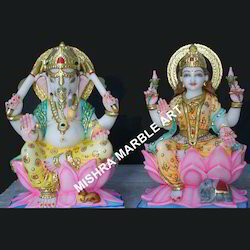 Our organization offers Marble Ganpati Moorti that are carved and painted by creative experts. The detailing have been done with utmost precision and it is assured that the weapons and other features of lord ganesha are clearly visible in the structure. Extremely popular amongst our clients spread world-wide, these statues help us gain an edge over our competitors in the market. 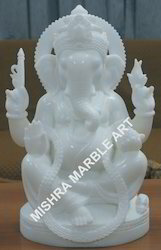 We have in store for our clients White Marble Ganesha Moorti that are reckoned for their appealing appearance. The products are acknowledged for their brilliant shine and radiance. Crafted in white marble stone the range is reckoned by clients across the globe. Our clients can avail the range at industry leading price rates. 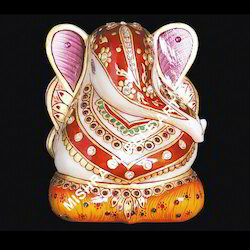 Our clients can avail bright and lustrous colored Ganesha Moorti. The experts use hand tools for rendering intricate details to the statue. Because of the fine finishing the structures demonstrate shiny appearance. We offer our range at industry leading price rates. Our professionals ensure that the consignments get delivered to the clients within specified time frame. 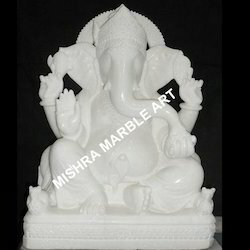 Ganesh Ji Marble Statue are in huge demand in the market for gifting and decorating interior spaces. These Ganesha Idols depicts the lord sitting on his shrine with his vahana the mouse. 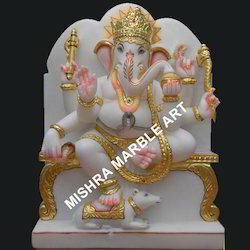 Our craftsmen and sculptors carve out these Ganesha idols using high quality white marble stones. The statue embellish this particular Ganesha statue has four hands, two of which are holding weapon and lotus, one hand has his favorite modak and another raised in the boon giving gesture. 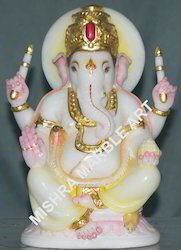 Our clients can avail bright and lustrous Sukhdatra Ganesha God Statue. The experts use hand tools for rendering intricate details to the statue. Because of the fine finishing the structures demonstrate shiny appearance. We offer our range at industry leading price rates. Our professionals ensure that the consignments get delivered to the clients within specified time frame. Our organization offers Ganpati Moorti that are carved and painted by creative experts. The detailing have been done with utmost precision and it is assured that the weapons and other features of Lord Ganesha are clearly visible in the structure. Extremely popular amongst our clients spread world-wide, these statues help us gain an edge over our competitors in the market. 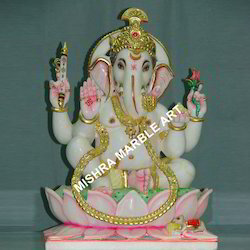 We are engaged in providing an exclusive range of Ganesh Ji Statue. These are designed using natural stone and marble.This statue is a perfect gift for decorating homes. Furthermore to enhance the features of this marble statue, subtle colors have been used. Our organization offers Ganesha On Singhasan Statue that are carved and painted by creative experts. The detailing have been done with utmost precision and it is assured that the weapons and other features of lord ganesha are clearly visible in the structure. Extremely popular amongst our clients spread world-wide, these statues help us gain an edge over our competitors in the market. 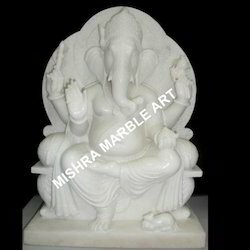 We also offer a comprehensive range of Marble Ganesha Moorti to our clients as per their requirement. These statues are processed using white marble and stones. 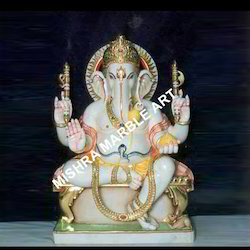 In this statue Ganesh God is sitting idle. Furthermore this statue finds huge demand in the industry for the high finishing, quality and good look. Looking for Lord Ganesha Statue ?